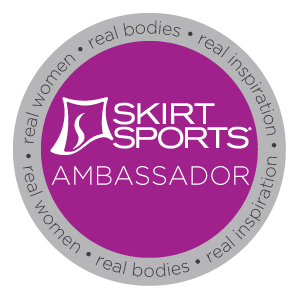 Disclaimer: I’m an ambassador for the Esprit de She races. I received a complimentary entry for the Sprint triathlon for my 2014 Ambassadorship, but my opinions are my own. 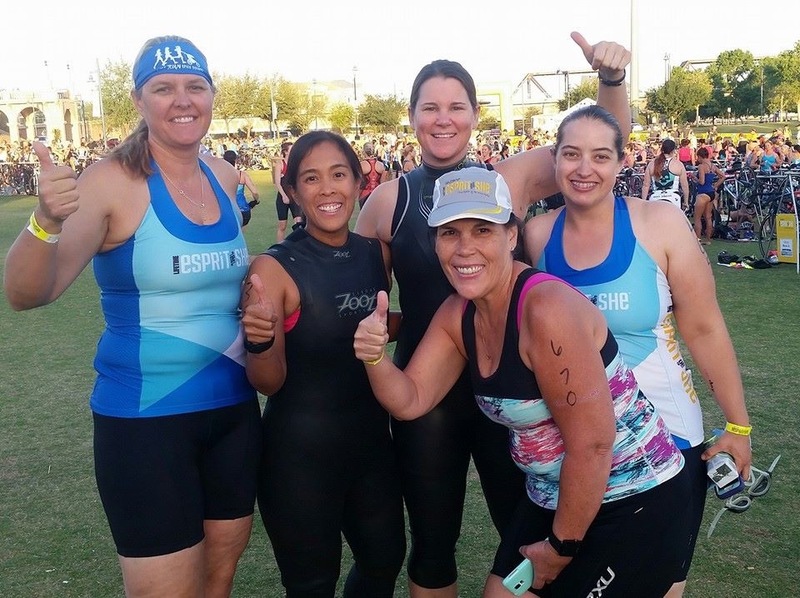 The Esprit de She Sprint Triathlon was my big race for 2015. When I initially registered, I had my eyes set on improving my Super Sprint times. Since February, I have increased my swimming and biking endurance, so I moved up from the Super Sprint distance to the Sprint Distance. I’m still smiling from ear to ear about my experience from this year’s event! We had a big turnout from our Moms Run This Town group and I love that I get to see my IG and FB friends! I love to document everything, so I’m splitting this up into a separate posts. I met reader Jenny while at the store. It’s a bit surreal when someone tells me they read the blog. I thank the power of Google and my posts on the open water swim for connecting us! The great part about the early packet pickup is being able to sticker my bike without feeling pressured at the transition area. The bad part is that you’re banded for several additional days. On Saturday afternoon, it was time to check in My BFF and head to the race talk. This was actually the first time that I was leaving My BFF overnight. It always feels a little weird for me to leave the bikes in transition. Of course, I had to take pictures so I wouldn’t forget where I left her. Next time, I’ll remember to bring a towel to tuck her in overnight. The Esprit de She Brand Ambassadors had meet up before the pre-race talk. On a somber note, earlier in the week we found out that we lost one of our EDS sisters, Penny Verdek. We kept Penny in our thoughts and added jewels to our race bands in her honor. It was great to meet Lauren and Denise; and to see Lindsey (EDS founder), Amanda, and Belinda again. We took some fun pictures and we were also introduced to the crowd during the race meeting. That was a fun, but I’m sure I made some weird awkward face. It was toasty during the race talk, and I was just trying to keep myself shaded and hydrated. After the race talk, I headed home to relax (read: clean house) and prep for race day. I got up around 4:00am and started to get ready for the day. 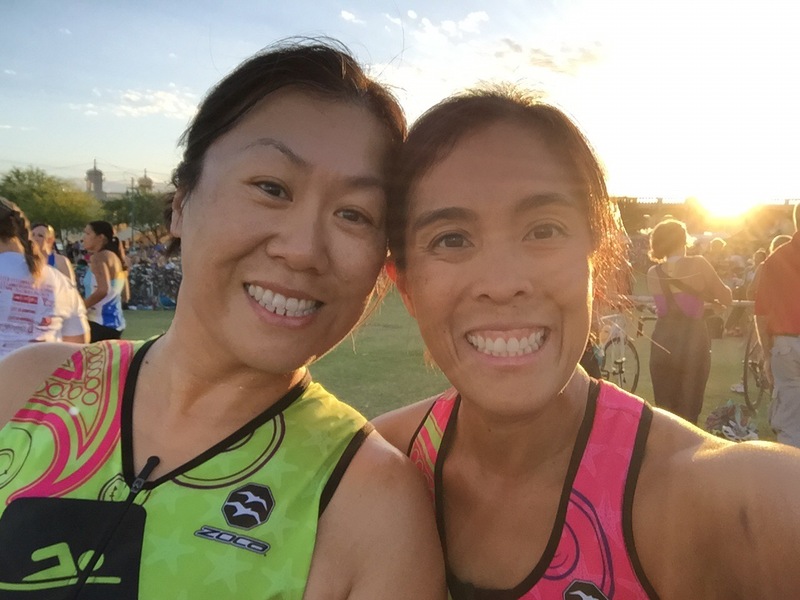 I picked up a fellow MRTT mama on the way to the race and we chatted as we drove to Tempe Beach Park. I ate my Chocolate Honey Stinger waffle on the way. 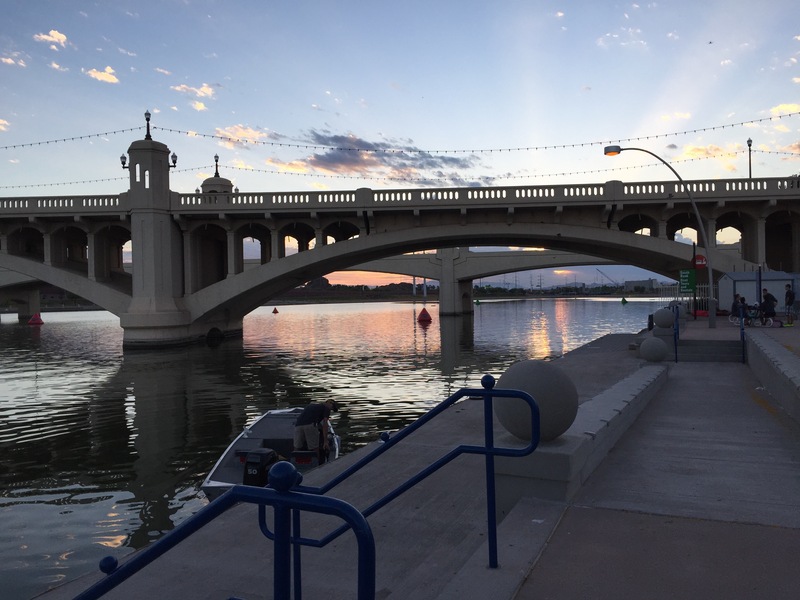 We almost paid for parking, but then we decided that it was still early enough to hit the free parking garage across from Tempe Beach Park. Thank goodness, since we made it in plenty of time. She was doing the duathlon and picked a really sweet spot close to the Run Out section. I reunited with My BFF and chatted with fellow EDS ambassador Denise who was also in my rack and I noticed that Esther was just a rack over. I ran to the rest room and then laid out my transition gear. 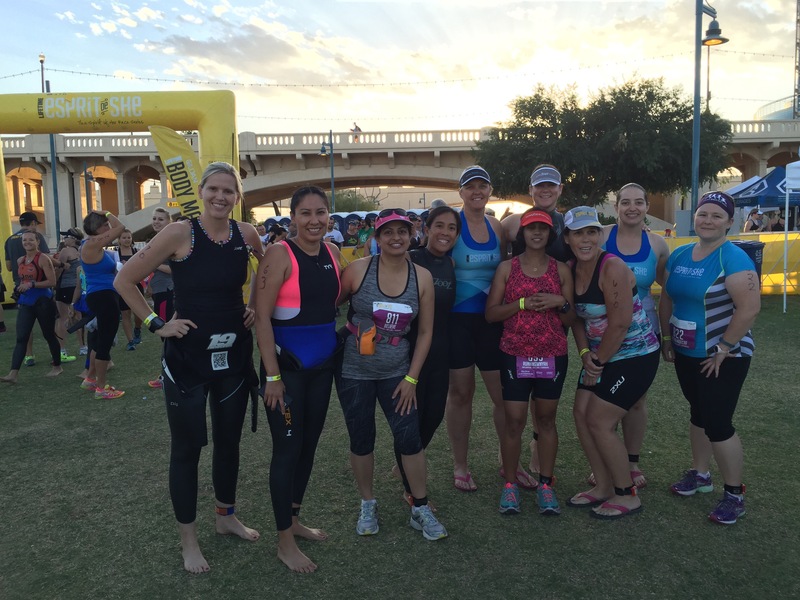 The MRTT ladies met up for a few pictures and before we knew it, it was time for transition to close. To be continued! Next up — the swim! Posted in Ambassador, TriathlonBookmark the permalink. I’m happy you had a good race! I love that picture of us, is it ok if I copy it? Thanks Lauren! Yes, you can definitely use it! I’ll try to send you a copy via email.